To say this past week was incredible in an understatement. I have officially checked #10 off of this list and it was in an unexpected way. The goal of attending the 2016 Summer Olympics in Rio is still in the forefront of my mind, but the impact of volunteering for this years Special Olympics World Games will be something I will cherish forever. The amazing experience I had has been published in an article I wrote for Elite Daily and I am extremely grateful to my editors for giving a shout out to the awesomeness of these athletes. That being said, so much has happened since that article has been published. We had the medal games for each division and let me tell you, they were nothing short of nail biters. Two of the three games came down to one run games at the bottom of the final inning. The USA, India and Puerto Rico all took the gold medal in their respective divisions. One of the most incredible stories to come out of this week was India, the team that traveled the furthest to Los Angeles to compete. The team had no cleats, no baseball pants and no fans in the stands. However, on Saturday they came in as the dark horse and upset the Australians. The team had not practiced together until reaching Los Angeles, yet they pulled off this amazing win. The excitement on the athletes faces were priceless. They jumped for joy, taking off their shirts and screaming to the fans in the stands. Even with the scorching heat, fans came out in droves for the all day event. The men, women and children who came out to support the special athletes endured the heat with Easton Field offering no shade. But I know, their fandom was greatly appreciated by many. 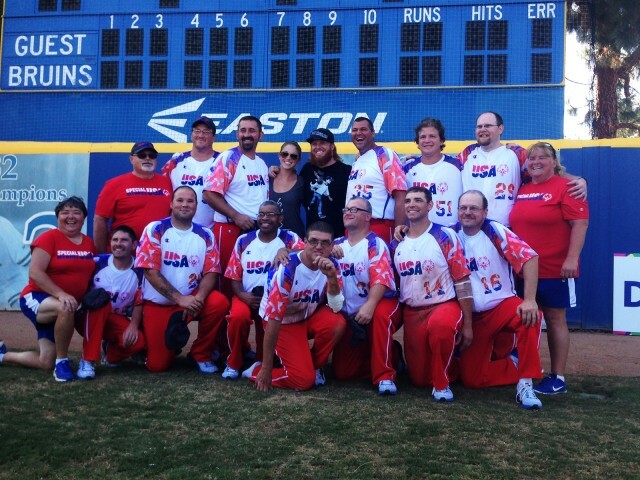 Justin Turner also made an appearance at Easton Field and watched the USA Missouri team take on Canada. Although they would lose the game, the Dodger gave the team a reason to smile with an invite to attend the Dodgers batting practice for a game the following night. I know just how lucky I am to be able to volunteer all week, as many individuals are unable to with life’s responsibilities. However, if there is anything I can recommend it is that you call your local Special Olympics chapter and see how you can contribute. Although the World Games are only every two years, the local Special Olympics hold events every year. I have talked to many individuals who work or volunteer with the organization and they are always in need of work hands in many different capacities. I want to leave this post with saying thank you to so many people. First, thank you to all of the athletes, I am not sure you are aware of all of the lives you changed this week. Thank you to my fellow volunteers who came with amazing and friendly attitudes, which made this week much more special. Thank you to my friends who came out to support so many of these events. I realize how lucky I am to have friends with such compassionate hearts.